Vanquish your adversaries. At Bekking Fencing Academy, we have the capability to propel you to the top of the podium in international fencing competitions, swiftly cutting down your rivals (on the piste and in life). One-to-one, vigorous training programs are at the core of our academy's training. Aspiring fencers will be challenged, mentally and physically, to overcome personal barriers and develop unwavering discipline. With this, you will learn to pick yourself up again after every fall, and with great determination and perseverance, continue to hone your skills until you emerge victorious by defeating your own shortfalls and your competitors on the piste. 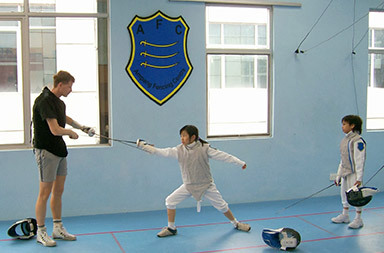 Competitive training involves avid participation in international fencing competitions. It is an integral part of learning and strengthening of self under intense pressure for the fencers, to stretch themselves beyond what they imagined they could achieve and, one day, be recognized in the international arena.